Our little porch roof doesn’t generate a lot of runoff when it rains, but it’s enough to warrant the use of a gutter and downspout. I’ve always wanted a rain chain, so this was a perfect opportunity to put one to use. 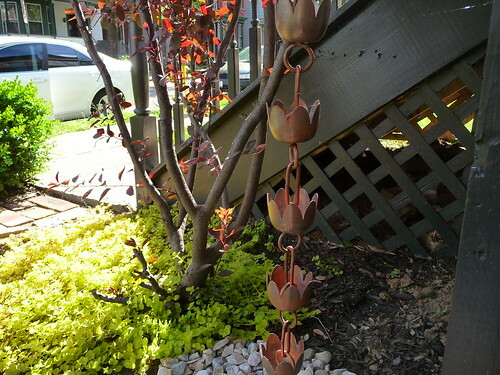 We bought this heavy, copper Lily Flower rain chain and had our contractor hang it from the gutter for us (our porch roof is very high off the ground, and we don’t have a ladder that reaches!). The rain chain has a bracket at the top that fits into the outlet hole of any standard gutter. I was sort of hoping that it would rain today (okay, not really) so I could get a photo of the rain chain in action, but you’ll just have to imagine the water cascading down the chain and spilling over the sides of the lily-shaped cups. I tested it out with the garden hose, and it looked beautiful! I’ll try to make a little video the next time it rains. To provide drainage, we built a miniature underground brick-sided well at the bottom of the chain and filled it with river rocks. We buried the last few links and cups of the chain to help with stability and to prevent the chain from swaying in the wind. If you’re interested to read more about rain chains (kusari doi), Lindsay from Ouno Design did a nice post on them a couple of weeks ago. 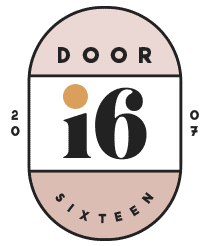 Curious to see what the front of Door Sixteen looks like nowadays? Four years of hard work has brought us to this point. Not bad! 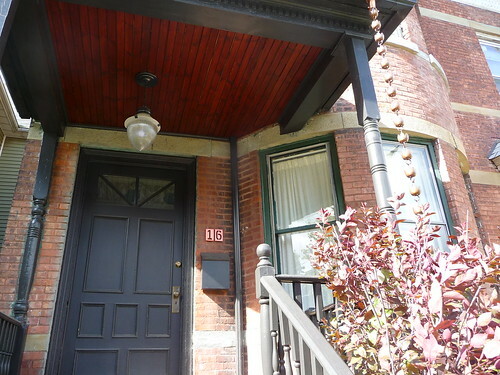 We still have lots more to work on with the exterior of the house (restoring/repainting the outside of the original windows and rebuilding the frames is next on the agenda), but considering how bad things were less than 10 years ago, I’m feeling pretty proud about what we’ve done for this place. 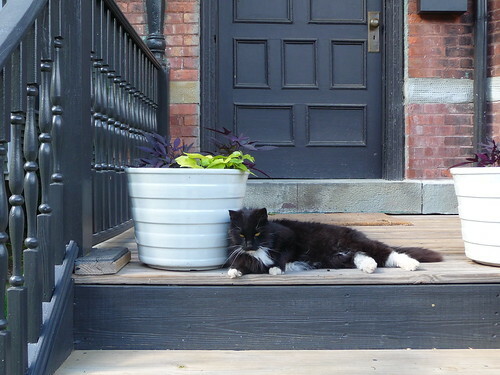 I know some of you have expressed interest in knowing how “our” stray cat, Sylvester, has been doing (I wrote about him back in November over at Victoria’s blog), so I took a photo of him lounging on the porch earlier today. Of course, he sneaked into almost every other photo I took of the house, too, but he’s a cat—that’s what they do. Sneak. wow – that’s awesome. i’ve never seen one of those before. genius! cute! looks much better than a regular gutter! Lovin it! *hugs from Conroe, TX! Love this!! S. had heard of them but I haven’t — now I can’t wait til we have our own little house that needs one! So pretty. You’re home is lovely! The rain chain looks great! 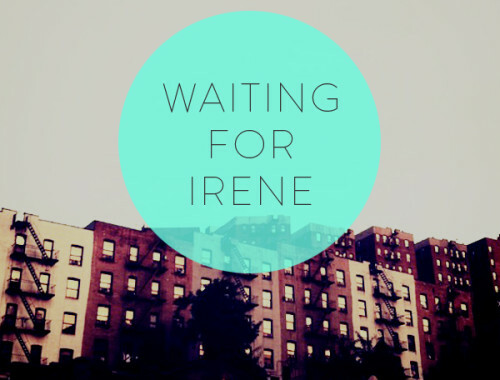 May I ask if it will it weather to a greenish colour? Oooh Sylvester ! Glad to see he’s doing ok. 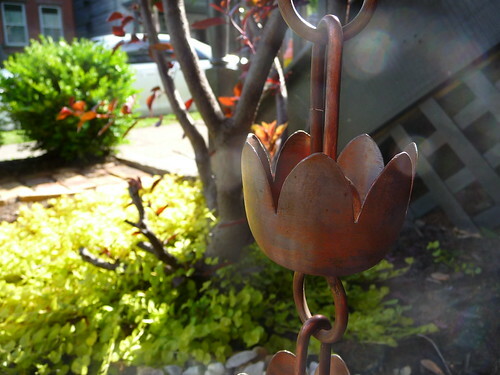 I had never before heard of rain chains – beautiful discovery ! How wonderful, it looks great on the house. What a lovely solution. I wish all solutions could be as esthetic. Wow! I am shocked at how much your story reminds me of my own! I work in a very run down area in Detroit. We started having a cat come around who took a liking to me. After 9 months (and having 1 litter of kittens), I was able to nab her and bring her to my house, where she lives very happily. I was just sick of worrying about her when I left. Sly is one lucky cat 🙂 PS, your home is looking great! Love the rain chain, it looks so beautiful. We just had our front porch redone and the gutters make everything look unattractive. The rain chain is a great idea to dress up the porch and make it look much better. Love the idea. Lucky Sylvester to have a nice family to depend on. Have you installed another one in the back-porch as well? Have you managed to make any advances back there (i.e. garden)? It is great having house updates again! 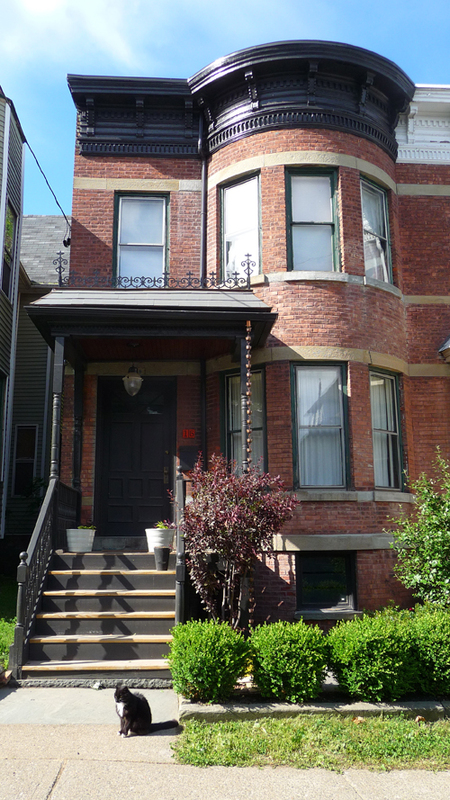 The front is looking gorgeous…especially in comparison to the decay from 10 years ago. I love these kinds of posts. Especially since it shows the potential of the entire city. Bravo. @Shannon: The entire chain is solid copper, so yes, it will eventually (probably many years from now) take on a deeper, richer patina. I’m looking forward to it! I love materials that change over time. @Danielle: I was worried about Sylvester during the winter (I built him an insulated shelter under the porch! ), but he fared just fine. It does break my hear to hear him meowing and wanting to come inside, but at least his life is a tiny bit easier now that he doesn’t have to worry about where to find his next meal. @Jorge: Our back porch doesn’t have a roof, so no rain chain back there! First time I’ve seen your blog – what a treat! Anna, thanks for the mention! Your chain is beautiful there – the copper against the brick is genius. And from a distance I love the way it looks like a simple studded chain but then is more detailed close up. Just beautiful. 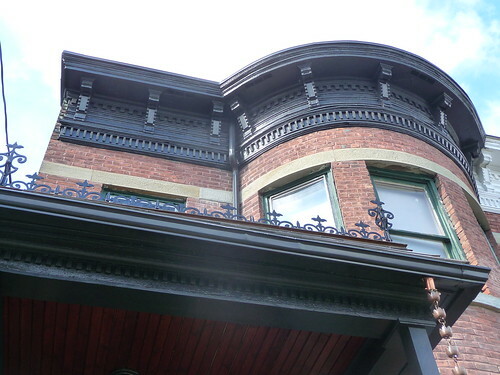 PS You did an amazing job on that top moulding – wow. That’s so cool. I didn’t even know such things existed. And Sylvester looks very happy there on your porch. I love those rain chains. It looks great! You’ve both done a beautiful job on your home. How lovely – I wish I lived somewhere that rained a lot so I could take advantage of these beauties. Wow, Anna! The rain-chain looks wonderful and your house is definitely dream-home status. I am proud of you too. You are totally my house hero. Where are those amazing planters from? They’re beautiful! I’ve always wanted a rain chain. My grandmother has one and it’s aged beautifully. love this! what a wonderful idea. xo! PS I envy you that cat. He’s sort of the ur-cat. If you looked up “cat” in an encyclopedia, there’d be a picture of him there. And I bet it’ll get even more character years down the road too as it ages! Looks great! Anna I love the rain chain! I’ve been wanting one for a long time but I can’t figure out where I would put it. We have gutters on the back of the house but our back “yard” is all concrete so I’m worried that the water will stagnate (and get into the basement). The place where the gutter leads into the drain is not a visible location…so it doesn’t look like i will be getting a rain chain. . I can’t wait to see pics of yours when it rains. The front of your house looks AMAZING! Anna, your front porch looks beautiful!! Are those new cellar windows I see too? That rain chain looks beautiful as well, I can’t wait to see it in action. I love that you have a stray cat, does he spend time with other people on your street? ooh, I need to see a video of this in action! SO pretty. 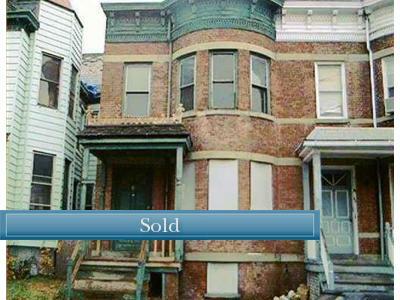 The front of your house is beautiful! 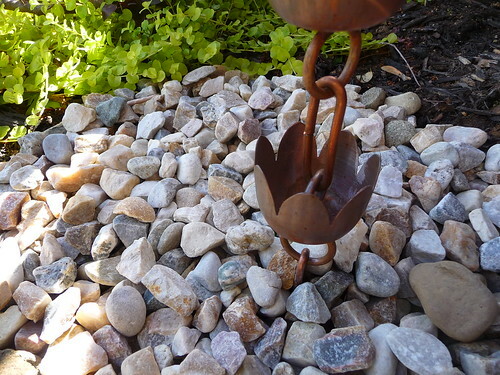 Nice work, and I love the new rain chain. i look amazing! wonderful job. oh, i loved those in Japan (http://stuffedmice.net/56) – looks beautiful! love the rain chain! any worries that it might grow legs and walk off since it’s made of copper? wow. that is quite a difference from then to now. it is really quite stunning. y’all have done an amazing job. I just love your design aesthetic. 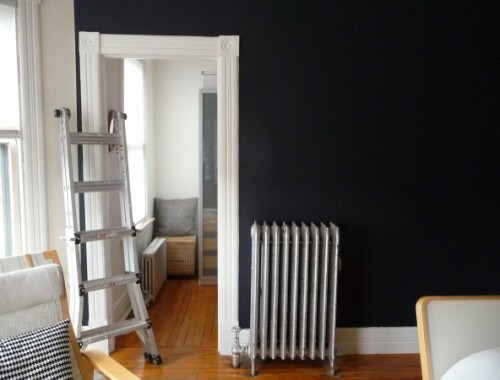 I always knew black and white was chic but never realized just how homey and comfortable it can also be. of course, I noticed even your stray cat is black and white! Oh how wonderful! A rain chain! My husband and I once stumbled upon a small Italian restaurant in Tokyo. It was raining and we found a small seat by the window. It made such a lovely sound. And the best spaghetti I have ever had too. super job!! you were great !!!!!! For your readers who are considering installing a rain chain on the front of their house on a busy street, an option is my woven aluminum rain chains, which are less theft-prone than copper. We make our copper and aluminum chains by hand in Oregon. Visit my Web site at http://www.oregongardenart.com to see them. Much better than a plastic pipe ending in a rain barrel. 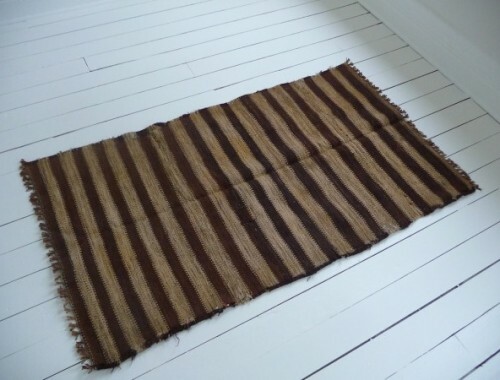 Could be just the thing for my Spanish cavehouse. Rain water just runs to waste at the moment. I want to collect it for watering the plants in summer. I used lengths of chain from Home Depot that lead to rain barrels off my three gutters (all tucked away from the front of the house). Not as pretty, not by half, but cheap, non-offensive, and functional!